Listen to a special SHAPE double bill broadcast on London’s Resonance FM/Resonance Extra – two recordings from last year’s Cynetart festival played back to back. First, you’ll hear sounds from the performance of TeZ, an Italian audiovisual artist and member of Clock DVA, and, right after, Mexican-born sound artist Laura Luna‘s show will follow. Both sets are actually sonic parts of audiovisual shows, yet they offer a very musical experience, and have been encouraged for radio broadcasting by the artists. The material by TeZ (recorded November 10, 2016) is the sound from his light/sound performance PV868, while Laura Luna’s show (recorded on the following day) was a collaboration with multimedia artist Pascal Silondi. Both performances took place at Festspielhaus Hellerau. Maurizio Martinucci (aka TeZ) is an Italian interdisciplinary artist and independent researcher living and working in Amsterdam. He has collaborated with, among other, Adi Newton, Scanner, Kim Cascone, Saverio Evangelista, Taylor Deupree, Sonia Cillari, Chris Salter, Honor Harger, Luca Spagnoletti and Domenico Sciajno. He uses technology as a means with which to explore perceptual effects and the relationship between sound, light and space. He focuses primarily on generative compositions with spatialised sound for live performances and installations. 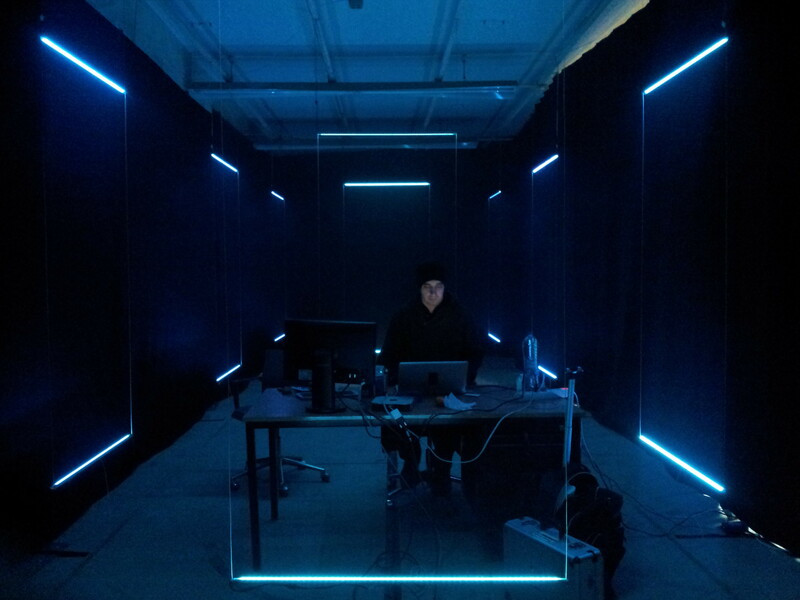 In his works he adopts custom developed software and hardware, featuring original sonification and visualization techniques to investigate and magnify subtle vibrational phenomena. In recent years his research has extended to the ideation and creation of specific architectural structures and unconventional sound and light propagation methods to enhance immersivity and multisensory perception. Laura Luna Castillo is a Multimedia Artist from Mexico that currently resides in Prague, Czech Republic. She began her artistic practice through photography, later developing an interest in video and film. While working with these mediums, she began to experiment with other forms of artistic expression that allowed her to investigate the mechanisms of memory, narratives and imagination. Within these explorations, sound became a central element of her practice, combined with her passion for machines, repetition, textures, generative narratives and the complexities of memory and associations. Laura Luna Castillo is a Multimedia Artist from Mexico that currently resides in Prague, Czech Republic. She began her artistic practice through photography, later developing an interest in video and film. While working with these mediums, she began to experiment with other forms of artistic expression that allowed her to investigate the mechanisms of memory, narratives and imagination. Within these explorations, sound became a central element of her practice, combined with her passion for machines, repetition, textures, generative narratives and the complexities of memory and associations. Castillo has developed different multidisciplinary projects, where different materials and technologies coexist as audiovisual performances, objects, installations and interactive works. In 2014 she released her first album, Isolarios with the label Baba Vanga, playing with processes such as feedback, error and accidental programming together with the overlaying of loops and field recordings.